Caring for an aging loved one, especially a parent, can take more commitment than any full-time job. Being on call 24 hours a day is physically and emotionally draining. In many cases, caregivers soldier on without complaint while their stress grows, their relationships weaken and their own health often suffers. If you are your parent’s primary caregiver, you likely already know how hard it is to find time to look after yourself and other family members, run errands or simply rest. Chances are, you just need a break. That’s where respite care can help. Many caregivers don’t know that respite care is an option, or how this service can change their lives. 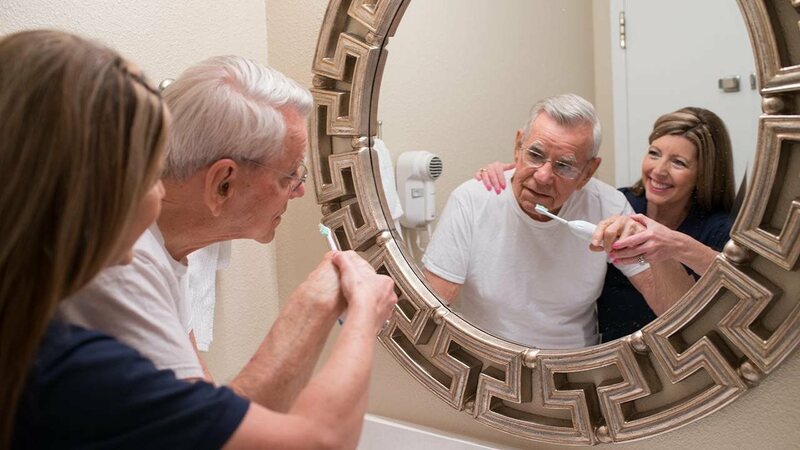 Most importantly, respite care can help improve the relationship you have with your loved one, while providing a new perspective on how to care for them. Respite care offers short-term relief to caregivers, allowing them to recharge, take a vacation or just a short break. It typically involves bringing your loved one to a senior living or skilled nursing community, but professional at-home care can also be arranged. Respite care can also be utilized after a short stay in a rehabilitation facility, a hospital stay or visit to an emergency room. A senior living community can meet your loved one’s care, social and nutritional needs. Respite care stays in a senior living community could last a couple of weeks, while respite care arranged in your home could be as short as a few hours or a full day. “I felt good about leaving my mom in respite care because I knew she was in good hands and I wouldn’t have to worry about her,” Matteson said. 2. When can respite care be used? Respite care can be used whenever you need a break or you are planning a larger event like a long vacation. In addition, it can be a valuable resource to use when your loved one’s health further deteriorates or a new complication requires special assistance. Respite care can also be used as a resource to help caregivers think about long-term care. Recognizing you may no longer be able to care for your loved one in a few years, you can use respite care to provide an introduction to a full-time care community. 3. How do caregivers know when they need respite care support? Besides vacations and other date-specific events, you should look for a respite care backup solution whenever the quality of the care you are providing or your own health suffers because of the obligation. Choosing to move forward despite these hardships is only jeopardizing the health of yourself and your loved one. It can also cause friction in your relationship, sometimes leading to resentment. Taking a break — and ideally relaxing and having some fun — will allow you to come back and apply more passion to the care you provide. 4. Where can you find respite care resources? Many senior living communities, including Brookdale Senior Living, offer respite care services, so they should be your first point of search. Look for senior living communities that are close to you, allowing for easier transportation and visiting opportunities. You can also ask your loved one's doctor for respite care options in your area. It may even be possible to obtain respite care in your home from a qualified provider. Research your options thoroughly and look for the solution that best matches your need. 5. How much does respite care cost and does insurance cover it? Not all insurance plans will cover respite care services, so be sure to read your policy. Visit the senior living communities that interest you to learn more about the services they provide and the expenses involved. If possible, bring your loved one to visit the community with you. They will be more positive about the decision if they have a say in where their care is provided. To learn more about respite care services at Brookdale Senior Living, visit Brookdale.com. Here are two things you should know about respite care. Respite care is a short-term stay for patients at a senior living or skilled nursing community. Respite care stays in a senior living community can be for a week or longer. These stays can also be a great way for caregivers and their loved ones to test out a senior living community and see if it is a place they would ever consider moving permanently. 2. Where can you find respite care resources? Many senior living communities, including Brookdale Senior Living, offer respite care services, so they should be your first point of search. Look for communities close to you, as this will allow for easier transportation and visiting opportunities. You can also ask your loved one's doctor for respite care options in your area.